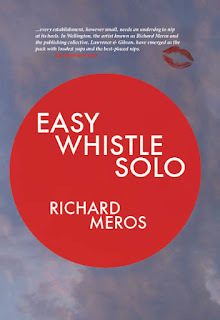 suggested then Easy Whistle Solo will be as much a tale of revelation as it is a novel. Oh yes! : it is easy to whistle by your self. You can whistle for an afternoon, or you can whistle for a whole life. 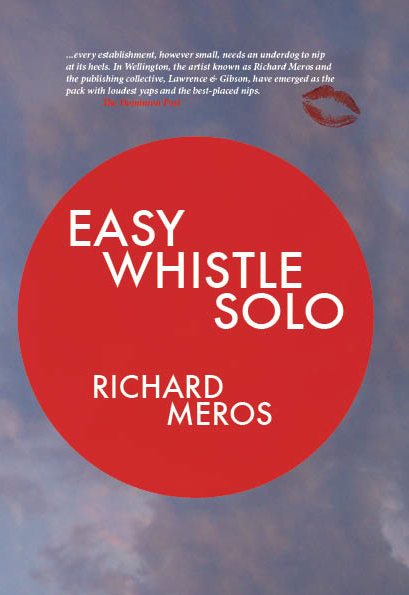 Richard Meros found his tune and whistled his way to 49 years of a life left alone to over-zealous, but under-appreciated writing and escapist travel. When he meets the daughter of a woman who had consumed his love — aorta and all — he is thrust back into his compelling world of lust, confusion and absurdity. “...every establishment, however small, needs an underdog to nip at its heels. In Wellington, the artist known as Richard Meros and the publishing collective, Lawrence & Gibson, have emerged as the pack with loudest yaps and the best-placed nips.” - The Dominion Post, 2011.